This imaginary monster, called Moz, has been revealed as the official star of the £7m advert. It is shown hiding under the bed of Joe, a 7-year-old child who is woken by snoring and rumbling sounds beneath him. The two-minute advert will premiere on TV screens this evening at around 9.30pm on Channel 4 and at the same time on all of Sky’s own channels. As with previous John Lewis adverts, it cost around £1m to shoot and a further £6m to cover marketing, in-store advertising and taking TV slots in advert-breaks. Viewers cast their verdicts on Twitter: "So ready to cry," said one. "Lost their magic touch," said another. The ad has appeared on the store's Youtube channel and will preview on television on Friday night. Reviews so far have included "heart-warming" to "disappointing", with some questioning how "Christmassy" the story was. The campaign follows the release of other big-budget festive ads from Marks and Spencer, Argos and Debenhams. The edit is produced by award-winning film director Michel Gondry, best known as director and writer of Eternal Sunshine of the Spotless Mind. The collaboration between Gondry and the retailer is highly lucrative for the latter thanks to Gondry's' expertise in producing highly-acclaimed commercials for the likes of BMW, Coca-Cola and Levi's. Alongside the launch of the advert, John Lewis has produced five pieces of merchandise featuring Moz, including a children's book, gender-neutral pyjamas, and slippers, with prices ranging from £5 to £20. John Lewis has become the hallmark of Chritsmas ads in the UK, but faces increasing pressure from other big UK retails. 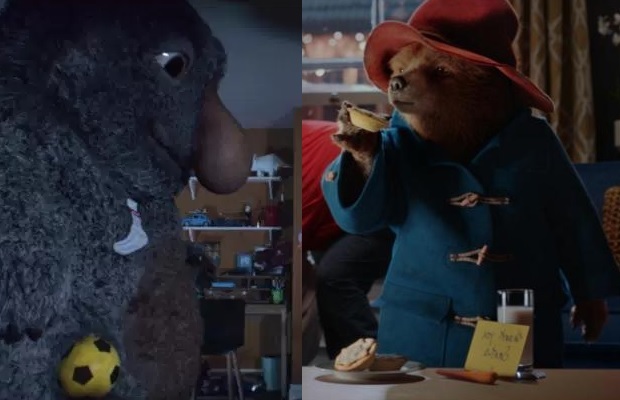 This year, Marks and Spencer has gone big b tying in iconic Paddington Bear to it's Christmas advert. 'Paddington and the Christmas Visitor' sees Paddington Bear stumbling across a burglar he mistakes for Father Christmas. The Sainsbury's advert is set to premiere on Sunday on ITV. Brands are expected to spend a record £6bn on Christmas advertising this year, according to the Advertising Association.